Happy Valentine's Day! We are making our way through new releases week, so today we are going to look at Violet Clouds, a new limited quantity Shake 'N' Shimmy ink from Robert Oster. Only 100 50ml bottles were made, and each comes with a letter of authenticity signed by Robert Oster. I purchased my bottle of ink from Pen Chalet, the only retailer in the US to carry it right now. Violet Clouds is a light purple with lots of shimmer. 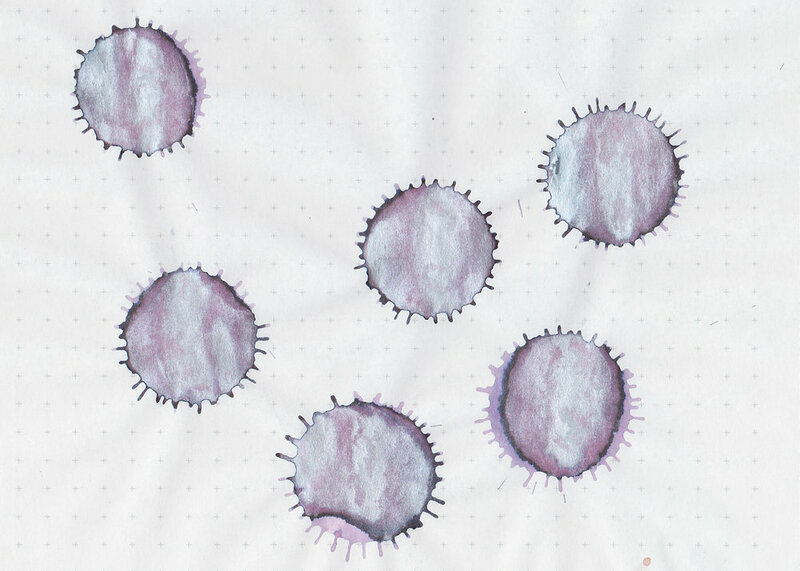 I think this ink would be lovely to use for spring, especially around Easter time. A lot of the shimmers on the market are bright or deeper in color, which are great for summer through winter, but there haven't been a lot of more pastel shimmers. It's nice to see some pastel shimmer more suited to spring. Other properties: medium shading, no sheen, and tons of shimmer. On 20 pound copy paper the ink behaved really well, just a little bit of feathering. Ink swabs for comparison, left to right (top to bottom for mobile RSS): Robert Oster Summer Storm, Robert Oster Violet Clouds, and Sailor Jentle Fuji-musume. Click here to see the Robert Oster inks together, Shake 'N' Shimmy inks are at the bottom of the page. Organics Studio Potassium Lavender, Sailor Jentle Nioir-sumire, and Diamine Amazing Amethyst. Click here to see the purple inks together. I used a Pelikan 400N on Tomoe River paper, then I switched to a medium Pelikan M400 White Tortoise. I loved the ink in the 400N, but did not like it in the medium nib. It just felt scratchy and inconsistent. The ink had an average flow. Some inks just don't work well with specific pens or nibs. There have been times I love an ink in a broad nib, and hate it in an extra fine, and this is one of those inks. It didn't do well with a medium, but is gorgeous in a flex. It was easy to clean out, no problems there. Overall, it's a nice ink. It's lovely to have a shimmer ink that works well for spring. I think in the future I would only use it in a flex nib. The shimmer is too high maintenance for the smaller nibs, and feels too scratchy, but it performs well in the flex nib. Give it a try, you might love it.